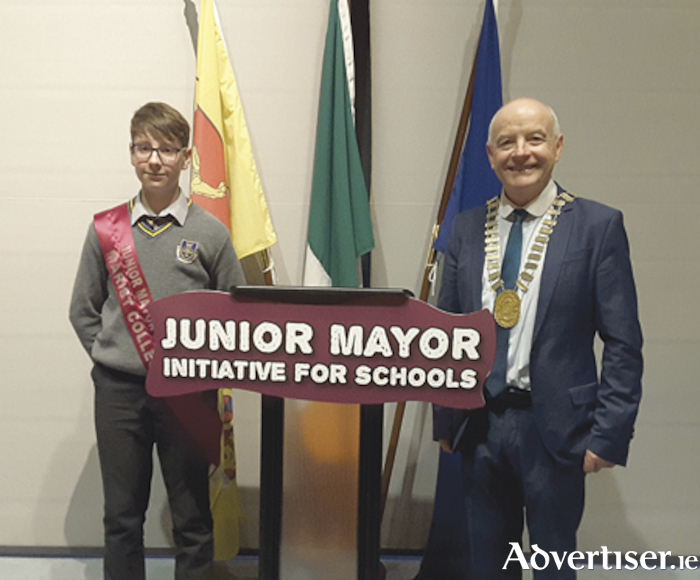 A large group of parents, teachers and students attended a very successful event in the Athlone Civic Chamber on Friday last to mark an exciting and innovative Junior Mayor initiative which has been introduced to primary and secondary schools in the Athlone Municipal District area by Mayor of Athlone, Cllr. Frankie Keena. Speaking at the event, Mayor Keena remarked that he wanted to offer something different during his term in office and to leave a legacy that can be carried forward by future Mayors. “What better way to do this but to engage with our younger population and I am heartened with the strong response and warm welcome to this initiative from schools to date. The beauty of this initiative is that it is in keeping with an element of the Department of Education’s Wellbeing Policy Statement and Framework for Practice 2018-2023. I thoroughly appreciate the strong uptake from the various schools in the locality as I am very much aware of the busy workload that teachers carry out on a daily basis and thus I would like to thank them for embracing this initiative,” Cllr. Keena commented. The schools participating to date are Cornamaddy NS, Clonbonny NS, Ballinahown NS, Baylin NS, Our Lady’s Bower Secondary School, Moate Community School, Marist College, Athlone Community College, St. Oliver Plunkett Boys NS, Ardnagrath NS, Coosan NS and Scoil na gCeithre Maistri. “Over the last while I have been busy visiting schools, giving the students a brief overview of the functions of the local authority and I was delighted to get some really interesting questions and comments back through that process. The main objective of the Junior Mayor initiative is to inform young people about the importance of democracy, to brief them about the functions and responsibilities of local Government and most importantly to give young people a voice by letting them have a say on issues that affect them,” Mayor Keena continued. In recognition of their new role, Mayor Keena presented each student with a sash plus a signed certificate. Under the initiative, each participating school elected or randomly selected a student to be its Junior Mayor for the academic year 2018/19. In turn, the students identified issues of concern which came under the remit of the local authority and presented these concerns to Mayor Keena when he visited the schools. These issues ranged from public safety, disability access awareness, speeding traffic, environmental to queries on heritage and tourism matters. While some issues can be resolved, it was explained to the students that all issues may not receive a solution due to engineering reasons or budgetary constraints but the main thing is that they will be given a voice. Mayor Keena gave the students an undertaking that he will follow up on these queries on their behalf with the Council executive. “The important thing is that there will be ongoing links with the schools over the academic year,” the Mayor concluded. Ms. Edweena Farrell also briefed those present about Westmeath Comhairle Na nOg and there was strong interest in that structure from the students.